Simi Hills Hole 2: The first par five of the day doglegs to the right, with the best drive skirting the trees to the right, or flying them for a big hitter. The second shot is wide open but the green is angles and has some pesky sand traps around it that the golfer definitely wants to avoid. 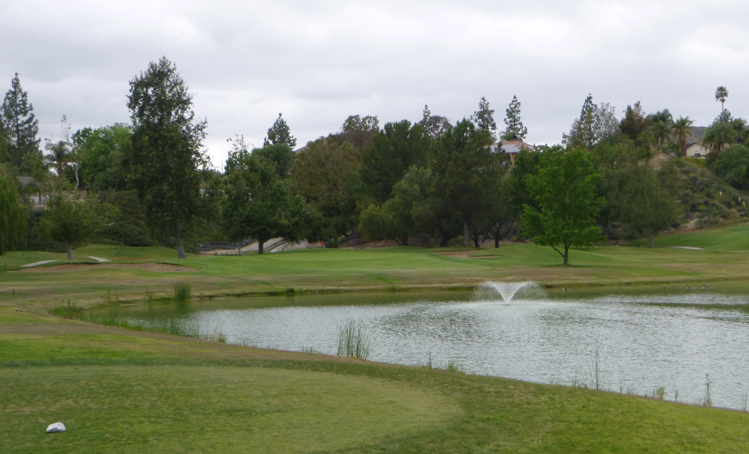 Simi Hills Hole 5: This golf hole presents a lot of options from the tee, ranging from an iron to a hooking driver over the lake. There is water left and OB right, so aggressive shots can be punished if hit poorly. The green is downhill and has two fronting bunkers and a steep slope long. 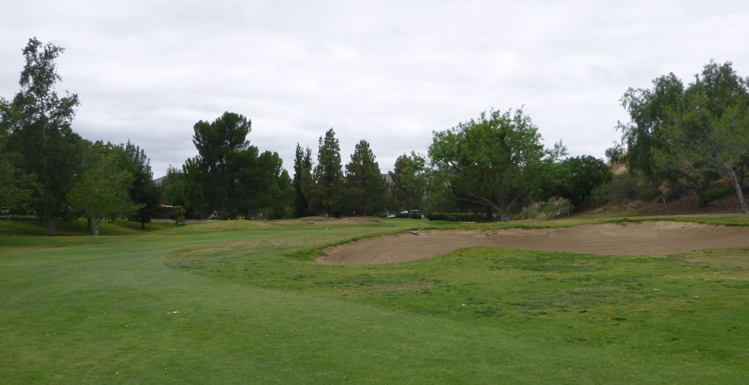 Simi Hills Hole 9: The finishing golf hole to the front nine has a large bunker to the right of the fairway and an even larger and deeper bunker short of the green. Avoiding those two is critical. 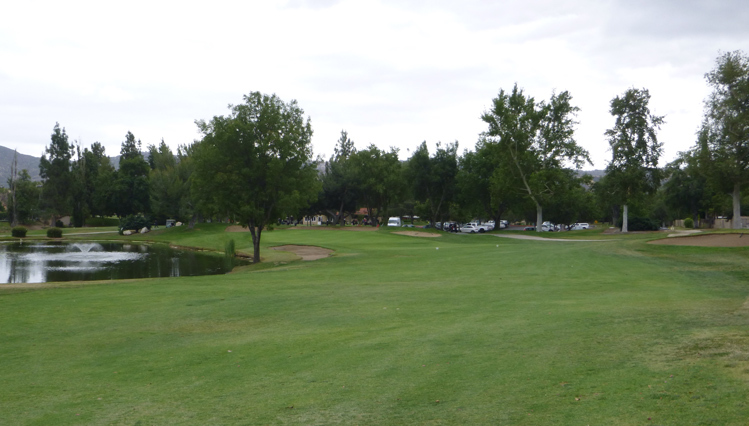 Simi Hills Hole 11 (left): The most difficult drive on the course has to squeeze between large trees and a creek left and the OB to the right. The fairway also runs out, so driver is not a good idea for a big hitter. The approach is a bit easier with a large green to hit. 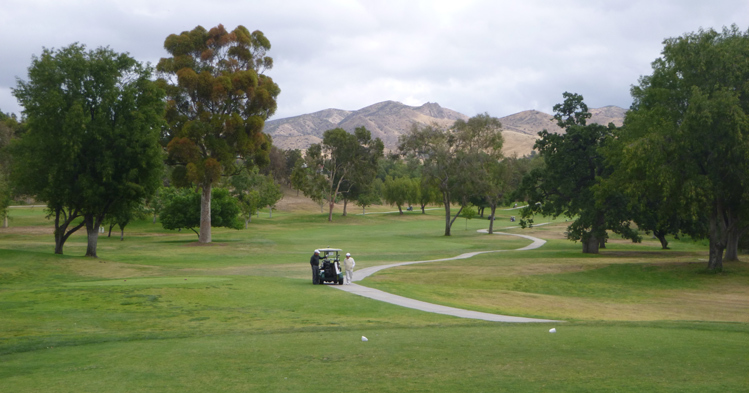 Simi Hills Hole 12 (below): The drive here is a little daunting given all the trees that seem to be right in line of sight. That is a true feeling as both a good drive and second will be needed to earn a G.I.R. Simi Hills Hole 14: This par four is not long, but the drive still must find its way between the lake to the right and the trees left. From there, the approach is uphill to a green with bunker just behind it and another left. 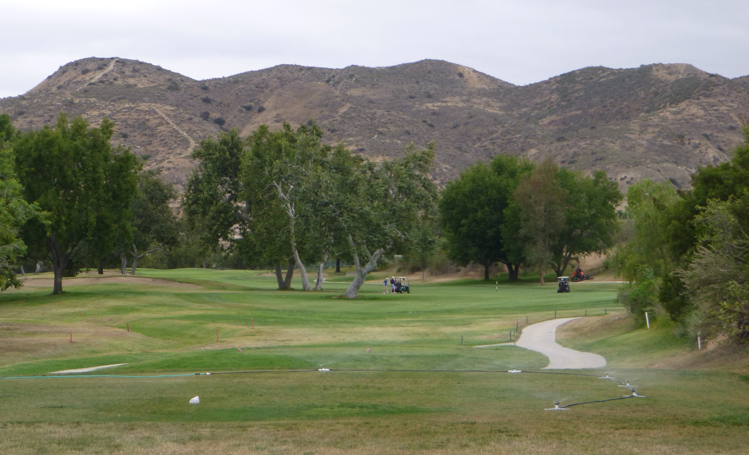 Simi Hills Hole 15: This long-ish par three has water in front, but only a pretty short shot would find it. Nonetheless, it takes a good strike to find the undulating putting surface. Simi Hills Hole 18: This par five is pretty standard fare until about 100 yards out when the water begins down the left side and ends up near the green. .